The system is smart enough to know the status of all cases and prepare an action list - or take action on a case based on the status. These actions include preparing documentation and providing electronic data to associated agencies or just about anything a procedure would call for. No more monitoring paper cases stacked on a clerk's desk. If you are tired of the workload of a paper case to print, copy, file, search and retrieve, lose, handle, store, and endlessly chase files. NO MORE. See what truly paperless does for the entire court. The use of digital signatures for Judges, prosecutors and staff and signature pads for defendants means that the system can file all court documents to cases. 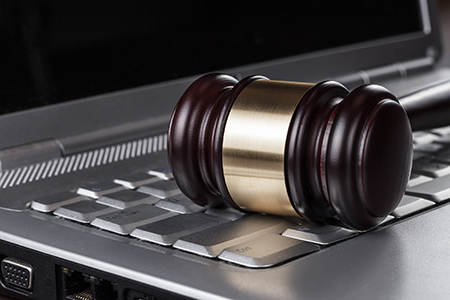 Digital means a virtual docket that is responsive to the needs of the court. Digital means the system works for you - not the other way around. Our state of the art paperless misdemeanor court system software has been created to serve your community more efficiently. Smart - doesn't describe all that this system can do. There is no paper generated inside the Court - only for defendants and parties who need a copy of a document when leaving the courtroom. Digital and electronic signatures for your staff and defendants enable you to eliminate paper and extra steps - resulting in a truly paperless court. You no longer have to run around chasing papers - everything is always at your fingertips. Online payment is part of the system as is seamless connections to Police and State agencies. Digicourt was developed to help manage any municipal court - large or small, and to meet the needs and roles within your court, including judges, court clerks and cashiers. Digicourt’s court system software helps you work more efficiently, automate tasks and documents, organize your schedule, track financials, report on key information and more.